The Magicsplat Tcl/Tk for Windows distribution is a binary distribution of Tcl/Tk for Windows systems. It includes commonly used libraries and extensions and is distributed as a Windows Installer package. Less is more! Why write a page of code when a line will do? 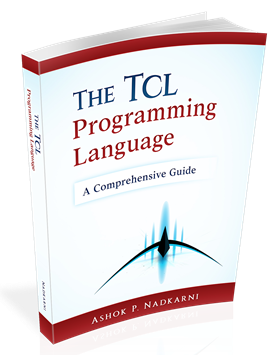 If you are programming on Windows, try the Tcl programming language with the Tcl Windows API extension. Streamline your Windows development. The Windows Inspection Tool Set provides cross-linked, filtered views into a Windows system. View operating system information, CPU and memory metrics, processes, services, users, network interfaces and connections, file shares, printers and more. Monitoring and logging capabilities notify you of events relating to resource status, network connections, process starts and exits, logons, service status and other system activity. The tarray extension implements an in-memory data store that provides efficient memory utilization and multi-core parallelized operations in applications dealing with large numbers of elements. The Xtal language complements tarray with a succint syntax for vector operations. Related UI widgets are provided in the tarray_ui package. A Web framework for lazy dogs, Woof! is an open-source, platform and server-independent web application framework. It is intended to be simple to understand and customize, easy to install and deploy, and embeddable into other applications. The ISAPI SCGI extension adds support for the SCGI protocol to Microsoft's Internet Information Server. The extension uses I/O completion ports to minimize memory and CPU usage. It is compatible with IIS 6/7/8. The tcl-vix extension for Tcl automates VMware virtual machine control and operations from Tcl. Start / stop virtual machines locally or remotely, snapshot management, execute programs, manage shares and more. The tcl-cmark extension is a wrapper for the cmark-gfm C library which implements a parser for GitHub-flavoured CommonMark/Markdown text format. Supported output formats include HTML, Latex, Unix manpage and plain text. The tclcsv extension implements a fast and flexible parser for reading CSV files including a CSV dialect widget. The promise package implements the promise abstraction for asynchronous programming in Tcl. Ruff! is a documentation generation system available as part of Woof! that uses runtime introspection in conjunction with comment analysis to generate programming reference manuals. See a sample. The hoedown Tcl extension wraps the Hoedown C library to enable conversion of Markdown content to HTML from within a Tcl program. Windows Inspection Tool Set 3.2.3.